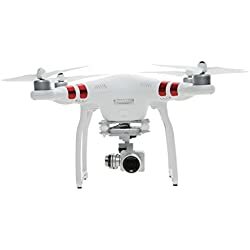 The current follow-up to DJI’s highly rated Phantom 2 drone, and is already receiving a great deal of praise from drone enthusiasts and businesses. As it stands right now, DJI’s Phantom 3 Professional line of drones are the highest rated RC drones on Amazon with many customers praising the video quality and its ease of use, which makes them one of the best choices for Professionals and novice alike. The DJI Phantom 3 Professional contains all of the tried-and-true features you’d expect to find in a DJI drone, like GPS navigation, auto take-offs and auto landings, intelligent high power flight battery, a built-in database of no fly zones, and a power mobile app with tons of settings and tweaks. Full HD video recording with fully stabilized 3-axis gimbal able to stream drone footage directly to YouTube. Lightbridge technology (PRO and ADVANCED models) Lightbridge allows users to see exactly what the drone sees live in HD via a stream, as long as they stay within a mile range of the drone. Vision Positioning system: Fly indoors, low to the ground, even when a GPS signal cannot be found . Visual and ultrasonic sensors scan the ground beneath your Phantom 3 for patterns, enabling it to identify its position and move accurately. All three offer single shot, burst mode, auto exposure, bracketed frames and time-lapse shooting. The DJI Phantom 3 Standard is the latest addition to the family, offering a more affordable entry-level drone for hobbyists. Uses standard GPS navigation and WiFi instead of GLONASS gps and Lightbridge like on the Professional and Advanced models. AUTOMATIC FLIGHT LOGS: Automatically logs and remembers the details of every flight you take. Complete flight route, flight time, flight distance, flight location, and cached versions of any photos and videos you took during your flight is at your fingertips for future reference. INTELLIGENT FLIGHT BATTERY: Has built-in sensors and bright LEDs that let you know the status and remaining power of your battery in real time. Your Phantom 3 continuously calculates its current distance from you and the amount of power needed to return, so you always know how long you can continue flying and when it is time to recharge. 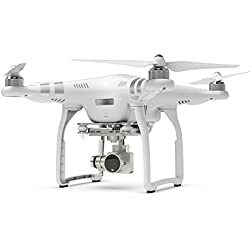 CONTROLS: The DJI Phantom 3 Professional is controlled with the Phantom 3 Remote Controller in conjunction with any iOS phone or tablet running iOS 8.0 or later, or any Android tablet or smartphone running v4.1.2 or later. Both devices use the DJI Pilot app which can be found on the Apple App Store and Google Play. As far as the physical controller is concerned, it uses a charge, as opposed to AAA or AA batteries. Automatic elements of your Phantom 3’s intelligent flight system help you fly and are available at the touch of a button. Auto Takeoff – With one tap in the DJI Pilot app, your Phantom 3 will turn on its motors and rise to a pre-set height. It will then hover perfectly in place until you direct it where to go. Auto-Return Home – When GPS is available, your Phantom 3 remembers the exact spot that it took off from. Wherever your aircraft is flying, tap a button to have it return right back home. Failsafe – If the Intelligent Flight Battery is running low, or if your Phantom 3 loses the connection with your remote controller for any reason, the drone will automatically return to the takeoff point and land safely. DJI recently announced that a much-needed autopilot features would be coming to its most popular series of quadcopters, and the Inspire 1. Waypoint Navigation, (map out a path in advance, and the quad will follow it), lets you set up a multi-point path for the drone to follow while you control the camera angle, and paths can be saved so you can recreate the flight again and again. Point of Interest (POI) flight planning allows you to set up an autonomous orbit around a subject at an altitude, distance and speed you select. The Phantom 3 will fly the path keeping the camera centered on your subject at all times. Follow Me (you can guess what that does — only coming to Phantom 3, not Inspire 1). Auto-Return home function allows your Phantom 3 to remember the exact spot it took off from, and as long as you have GPS signal, you can bring your Phantom 3 back to that spot with the tap of a button. There are also pro kits available with all the accessories you need and want in a combo pack, you can buy these items separately, but these bundles include everything like extra batteries, props, SD cards and more.